This is a folding seat and detachable storage tote all-in-one. The storage tote has easily accessible zippered openings, and it conveniently holds five metal garden tools on the exterior of the tote. Materials: Polyester, metal, leather Storage tote has zippered opening. 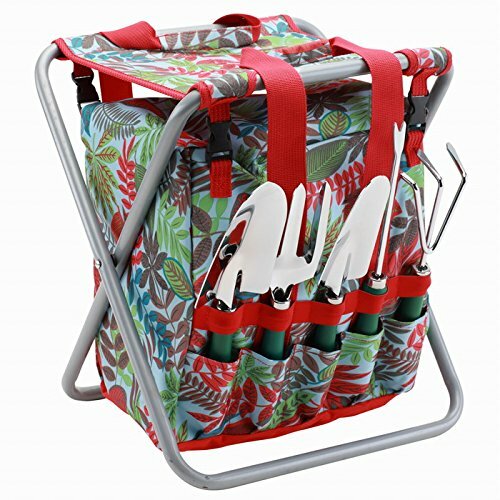 Conveniently holds five metal garden tools Lightweight and portable Sturdy steel frame Tool pockets on the exterior of the storage tote make them readily accessible when sitting in the seat . Storage tote fully detaches from the bag for versatility . 5 metal garden tools (large trowel, small trowel, garden fork, rake and weeder). Makes a perfect gift for those who love spending time in their garden. This is a Garden Tool Set with Tote and Folding Seat and detachable storage tote all-in-one. Garden tools are conveniently stowed in the outside pockets to be near at hand while other garden items van be stored in the attached tote. This garden stool has a lightweight aluminum frame with strong 6000 denier polyester seat and tote. Dimensions: 12.0 " L x 13.5 " W x 17.5 " H Weight: 4.5 Lb. If you have any questions about this product by Bo-Toys, contact us by completing and submitting the form below. If you are looking for a specif part number, please include it with your message.